This an example of letting the fabric do all the work. Thread writing - is there a catchy name for writing with thread that I don't know about? I've had this on my design wall minus the hiking shoes, dog and sailboats for months just waiting for the right idea to come along to take it from an ok landscape to "oh! Cool!" Someone on Instagram posted a photo of their feet and a mountain vista and that got me going. I traced the feet onto white fabric with a pencil, then layer it over black felt. First I tried with just the fabric and my machine would not accept that. She likes stability before she will free motion correctly so I obey. So then quilted over the pencil lines in black thread. Using my Inktense pencils I first painted clear hair gel all over it and then colored in. As you can see my first try was way to orange. But once it dried the legs were actually perfect so I just browned up the shoes a bit. I think they came out great! The only thing I would do differently next time is use a different white base fabric. It frayed a lot when I sewed it onto the quilt. I need to use something with a tighter weave so it doesn't fray. 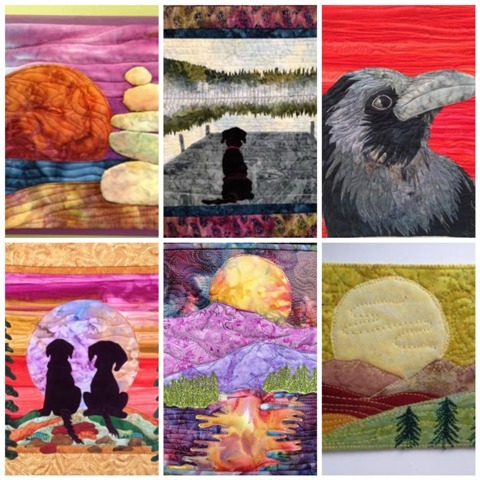 Since I'm doing a series of "wander quilts" I call this Wonder while you Wander which is another Instagram inspiration. Someone commented on a water quilt I posted that she orders while she wonders and I loved that - so thank you to both of the Instagram people who helped my get this boring landscape off my wall! What do you do when you have the day off and it's windy, rainy and downright nasty outside? Sew in your PJ's day! I just got this beautiful batik on sale from Hancocks of Paducah - love that place. So decided to play with that today so cut a square and sewed strips around it. Then fussy cut triangles to go around that so the Bears wouldn't be upside down or sideways. No undignified bear positions in my quilt. Course that leaves holes all over my fabric but, oh well. The sides will go like this. Let's make some birch, or actually bears like beech nuts so let's call them beech trees. This is where I'm at right now. I have no idea where I'm going with this. Just one of those figure it out as you go projects. Jason,is a friend at work and we joke around a lot about the joke that is the current president of the United States. It was Jason's birthday so I made him a lunch bag with his president's face on it. Jason, I hope you don't lose your lunch after looking at this face. I didn't take a photo of the completed lunch bag but here is me almost done with the quilting. I took a strange perverse pleasure in watching the needle go up and down in his hair. It looks pretty complex but not really. Found a photo on the Internet. I could not find one of him smiling so apparently the man never has. Then just traced the outlines with a pencil. After that it was just follow the lines doing free motion.